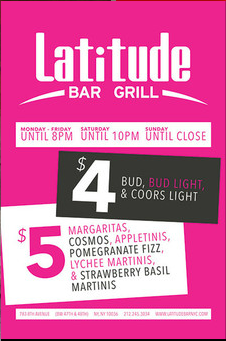 Latitude is a multi-level bar & lounge in New York City. With 3 floors and 4 bars, it is one of the largest bars in Hell’s Kitchen. The first floor has the 36-foot bar main bar, with tables & booths by a fireplace for dining. The 2nd floor has a red vintage style billiards room, with classic style furniture that also has a fireplace. Also on the 2nd floor is a wooden based “Mardi-Gras” bar, with 10 foot windows looking out onto 8th Ave. The 3rd floor houses an exclusive “Executive Lounge ” with a green/blue warm feel, beautiful lighting, corporate furniture and a VIP lounge. These rooms are available for private and non-private events. 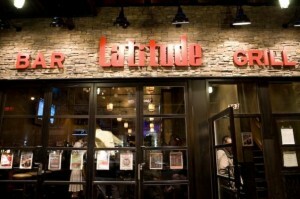 Call the Events Coordinator for parties additional information: 212.245.3034. Latitude has 20 plasma TV’s, located on every floor for public or private game watch parties.